Bug fix: Duplicate tabs were not being closed if ‘don’t move original tab’ was selected in options. Fixed. Update: On installation, and on startup, Clutter Free checks for any duplicate tabs that were already open. Notification is displayed, with a button to close duplicates, if any are found. Bug fix: Duplicate tabs were not being closed if ‘move original tab to the last position in the window‘ was selected in options. Fixed. Update: The latest update to the Great Suspender extension changed the suspended URL format. This was preventing detection of suspended duplicates. Updated. The direct switch icon is now hidden by default. Direct switch still works as before – directly switching to open tab when a link is clicked. The link highlight icon can be enabled from settings as before. Bug fix: Clutter Free will now not close duplicate tabs if they are pinned. Bug fix: Sometimes the tab count was zero when the browser started, or extension was updated. Fixed. Updated the on install process. Do not open options page. Instead, detect duplicate tabs already open, and show a notification offering to close them. 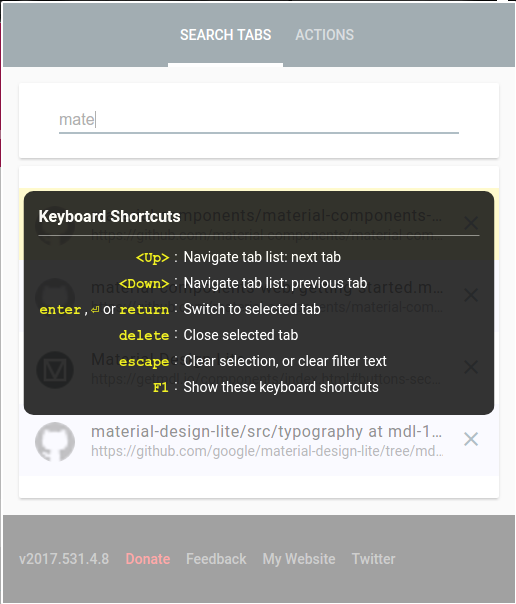 Quickly search through all your tabs from extension popup ( keyboard shortcut1: alt + x). Switch to selected tab, or close them directly from the popup. Pressing F1 brings up the list of available keyboard shortcut. Tabs suspended by ‘The Great Suspender’ extension appear with a slightly greyed out background. By default, the extension lists tabs from all windows. You may change this in settings under Options > Tab Search to show tabs only from the current window. The actions in the old popup (open settings, whitelist page, duplicate page, et al) are available under the Actions header. 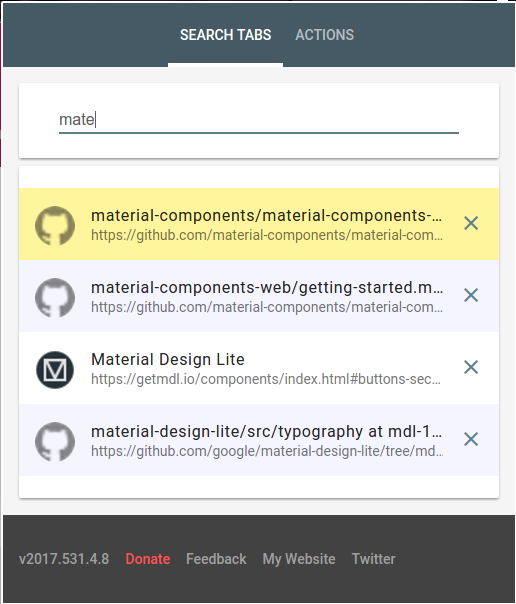 The extension opens in the same section as you used last time – actions or tab search. Made Clutter Free direct switch icon (highlighting an already open link) smaller, and transluscent. Lightening quick switch to previously open tabs. Direct switch links are highlighted with the Clutter Free mark ( ) next to them1. Clicking on a highlighted link will directly switch to the open tab. No delays, no web response time, no additional web data usage. Improved the options page, with 2 key sections – General settings, and Appearance. Defaults have also changed, and some little-used settings hidden/removed. Added automatic extension updates. 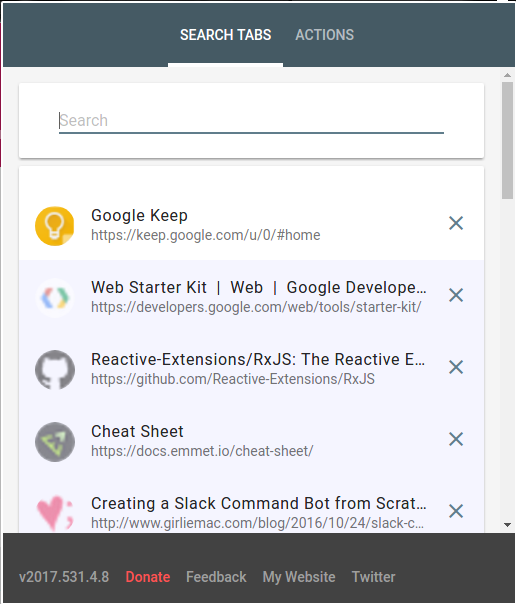 The extension now updates without having to wait for a browser or computer restart. New, greyed-out icon to indicate when the extension is switched off. If “Don’t move” is selected under Options > Advanced Settings > Duplicate tab position, a notification is shown when a duplicate link is opened in background. Link has options to switch to the original tab, and to go to settings. When a duplicate was opened in a new window, sometimes both the original and the duplicate tab were closed. Original pages were always refreshed, even when Refresh original page setting was off. Temporarily removed Ignore Hash setting. It is still available for anyone who has it enabled. Added new options to manage whitelist, and show/hide open tabs count, and fixed a recent bug. The big change is to how duplicate tabs are managed in the window – whether they get focus, where they are moved/located in the Chrome window. Have completely overhauled the way duplicate, and original tabs are located and focussed. The new behaviour now follows expected behaviour, without surprises. By ctrl/cmd/shift + click, or ‘Open link in new tab’ from right-click menu. focus stays on the source tab from where the link was opened. By clicking on a link. Bug fix: Whitelist stopped working after last update. Fixed.